I am happy to report to all of you that I had a pleasant visit with Marlene on Tuesday, March 15th. I want all concerned to know that our objections as to how Marlene was being treated for her mental illness in Brockville have had a positive effect. But first, this! Our dear friend experienced another incident of self-injury on Sunday, March 13 and was placed in a 6-point striker bed afterwards, but only for a short period of time. This was unlike the past when self-harm occurred, and it would mean many days (or weeks) of her being tied down. I think the publicity generated by our protests had something to do with the change in Marlene’s care. This particular incident of self-harm was not severe (a scratch on her nose) and was something Marlene said she did to assure the ‘protection’ of her young family members. The electroconvulsive treatments (ECTs) Marlene has been subjected to twice a week for over a month were supposed to stop her from self-harming. It seems clear to me that these barbaric treatments are failing Marlene. What she needs is the outdoors and smudging rituals. She needs a one-on-one counsel daily with an elder or with someone she trusts. She needs medication that works for her. If she had these things, Marlene would not injure herself ever again and could go on to live the normal, happy existence she deserves. To me an ECT works something similar to this. A human being is tied to a bed, somehow rendered unconscious (injection?) and subsequently the brain of the victim is tasered. The shocked brain reacts to the trauma it has undergone after the victim awakens, by not having the capacity to recall events which took place shortly before the ECT was administered. The person subjected to the ECT might have had a joyful visit with a friend one day and get tasered the next. The result? No memory of the visit with the friend and therefore, no healing benefit whatsoever from the joyful experience the visit brought into the life of a depressed mentally ill human being. Tasering is counter-productive. The old Anishinabe way, the smudging way, works best! For our People it does, anyway. Marlene will be going back to Saskatchewan soon. It is planned that she’ll be there by April 14th. Marlene has grown to become the ‘sweetheart’ of all of us who care about her. Let us keep her in our prayers. Marlene and I had a great visit. She walked (was not pushed sitting in a wheelchair) to the room where I was waiting. I told stories and we laughed. We prayed together in a circle. She ate the cookies and scones baked with love for her by students from the Elizabeth Wyn Wood Alternate Site school. I asked how the baked goods tasted. “Really good,” she answered, smiling broadly. 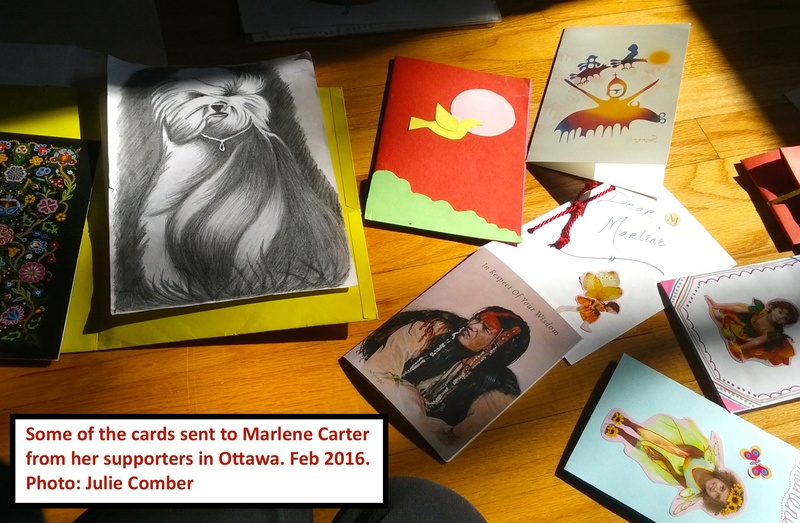 Marlene was very appreciative of the cards and good wishes she received from her friends in Ottawa. Marlene sends a gigantic hug to all! Let us be as one with the fact that mental illness is not a crime, that solitary confinement and seclusion is detrimental to the mental well-being of any person forced to endure it, regardless of cultural background. Let us appreciate that the sun, the wind, Mother Earth and the waters of the falls are the strongest of all healers. The poor souls of our communities suffering from mental illness should not be abused in any way. To beat down a human being stricken with mental illness makes no sense. It is the illness itself we need to attack with vigour and perseverance. And if it is possible to kill it with love, then damn it all, let’s start now. Love, compassion, empathy and the sacredness of the earth will join forces with us to rid ourselves of mental illness forevermore. All we need do is bring these things into our circle. Mental illness won’t have a chance. Forward ho! Let’s do it. This entry was posted in Community, Idle No More, Spirituality and tagged Aboriginal, Albert Dumont, Anishinabe, Brockville, Cree, Elizabeth Fry, hope, human rights, Indigenous, inmate, isolation, justice, Kim Pate, Marlene Carter, mental health, Onion Lake Cree First Nation, rally, seclusion, segregation, solitary confinement. Bookmark the permalink. Dear, Dear Albert, Dear Elder, and Dear Marlene! I am soooo happy to hear that you are going back home Marlene!!! This is a great victory for 1st Nations and people who make SENSE! I am with you into this and I am hoping to hear from you whenever you recover completely and want to share with us your experience, and the tremendous understandings I believe that must come from these. I feel very humbled to hear that you are well. I wish you to keep well, well, well, and better, better, better! My name is Nathalie and I’ve been through a similar problem within the medical system. At times, I still have outmost rage about their ways and the path the medical system chooses, pretending to heal, whereas, much harm is done. Rage and Fear are two things that keep me connected to this establishment, and you must know that I do have to find the ways to better myself in this regard so they will never use their abusive ways on me anymore. You are becoming a model of success, and I really hope to get the chance to know you better! I wish I could recover in natural ways as well. In my case, I am now clear in my spiritual direction, but have issues with the pharmaceuticals I am still on. I hope that one day I can be freed from them. Please let me know if I can do anything more to facilitate your freedom, and may the Great Spirit keep us connected and safe! It’s good to hear that Marlene is feeling better. I am so happy to here that she will be going back to Sask. soon.